It’s my Facebook Thirty-Dollar Thursday offer!! Red Chair, the final of the four lawn chair series is up for grabs today. Just thirty bucks for the painting (not including shipping). It’s an 8×8 watercolor painting on gessoed watercolor paper, matted to 12×12 frame size for ease in popping into a pre-made 12″x12″ frame. This painting would normally sell for around $75-$100 dollars each. No plexi or glass required with framing, as the painting has been finished with a Lustre varnish. 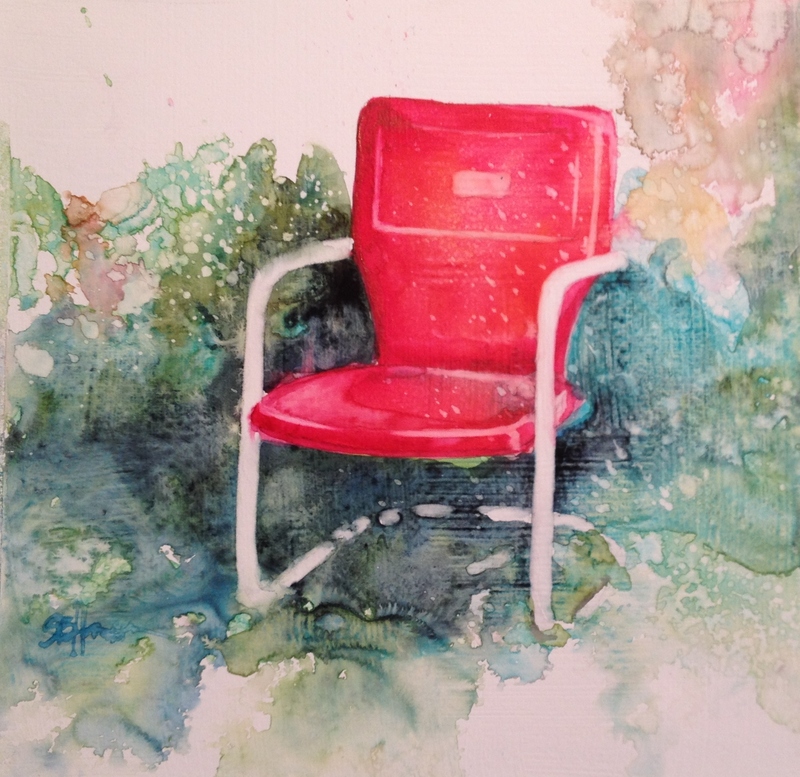 This is the last of the chair paintings for now…all three have sold quickly. Next week, I’m on to something else!! Tune into that later! If you would like to see how I paint a chair like this, check out my post on The Turquoise Chair and a Mashed Potato Day. Last week’s chair sold quickly, see Orange Chair post. Message me or find me on Facebook and let me know if you want it. First come, first serve. Now, on to more paintings this weekend. I’m planning on a brand-new something cool. Look for it on Sunday’s post! Feed the Beast, people! As the proud new owner of the Orange Chair (which came beautifully shipped and matted today!) I can honestly say that the pictures do not do the paintings justice. Beautiful color and amazing texture and on top of it all, it is frame ready! At this price I may have to break my art rule “the frame should not be more expensive than the art!” A great problem to have! Awww….you just made my day. You really did. I’m so happy you like your painting! Would you mind if I quoted you in my marketing stuff?